We pride ourselves on being the easiest payment partner to work with. We make it super simple for any developer or business to integrate Payfirma technology into what’s already working. The Payfirma API is flexible and easy-to-use. 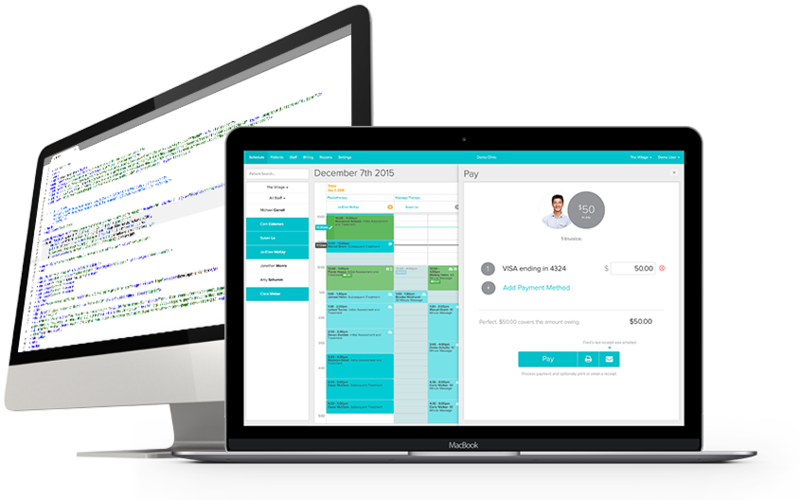 It uses a standard code structure so that you can seamlessly integrate payments into your app or software. Our API is one of the most developer-friendly solutions on the market – complete with an intuitive builder experience and customizable functions for every developer level. Integrate your shopping cart, hosted payment page, or eCommerce platform with our open API and start securely accepting payments in your digital environments. For information about working with plugins, contact one of our payment advisors today. When you partner with Payfirma, you offer your customers a turnkey solution. Payfirma takes care of your customers by setting them up with their own dedicated merchant account, 24/7 customer support, and complete PCI compliance. Payfirma’s straightforward API allowed us to easily build a custom checkout experience that integrated with their iron-clad Customer Vault. Their API code was clean, simple, and extremely versatile. It provided us the flexibility to seamlessly build payments into our service without disrupting our other systems or processes. Thanks to their developer team who have been with us every step of the way, our development process has been simple and stress-free. You get dedicated support (before, during, and after integration), an easy-to-use sandbox environment for testing, and comprehensive developer resources to help you build. Our platform PayHQ gives you and your customers a secure Customer Vault to store credit card information, responsive reporting to track transactions, and a dynamic data dashboard. You've got enough on your plate without worrying about PCI compliance. Payfirma takes the worry out of being PCI-compliant by ensuring sensitive customer data is always encrypted and access is tokenized. From restaurants to hotels to retail businesses and more, Payfirma integrates with popular POS systems in every industry to provide frictionless payments. Integrate your custom or existing POS software with our wide selection of terminals and easily accept payments in no time. We offer end-to-end encryption and fast terminal support and troubleshooting so you never miss a sale.